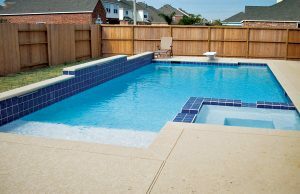 For many Fort Worth residents, the dream of a backyard pool has never been easier when they hire Blue Haven as their affordable custom pool builder. 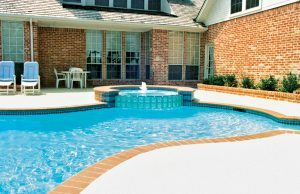 Whether we are helping arrange an inground pool loan, devising a project plan to fit into a side yard or sloped lot, or guiding pool buyers in selecting the deck material that best suits their home, our seasoned team of professionals stand ready to make the often-complex pool-buying process as easy as possible. 20,000-plus homeowners throughout the Dallas-Fort Worth Metroplex / North Texas own a Blue Haven Pool, as do tens of thousands more across Texas and the U.S. You can own one too by having our Fort Worth operation build your state-of-the-art, virtually chlorine-free backyard resort! No matter what you seek for an aquatic retreat, we can help develop your vision from the ground up. It all starts with a custom pool design. 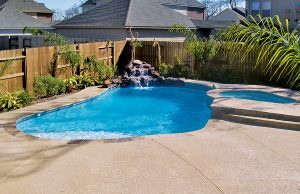 You can have a gunite pool & spa that incorporate a variety of pool styles, shapes and configurations, decorative elements, and functional features. Would you like a relaxing tanning ledge for catching some rays while staying cool in the water? How about a rock waterfall for beautiful sights and sounds? A swim-up bar for entertaining? An in-floor mosaic of your favorite sea creature or the Cowboys team logo? How about integrated landscape boxes to incorporate lush greenery into your poolscape? Keep in mind, our design ideas and construction services don’t stop at the water’s edge: Finish out your new pool & spa with a patio and hardscape installation that enhances the character of your space and add greater functionality to it. Choose from popular materials, including flagstone, Sundek®, pavers, travertine, and stamped and decorative concrete. Along with top-flight pool & spa construction, Blue Haven offers exclusive technology that will make owning an inground pool easier and more affordable than you might have imagined. From dazzling color-changing lighting to alternative pool purification systems, our complete array of SmartFeatures™ conserves water, automates pool operation, minimizes energy consumption, and delivers a healthier swimming environment. 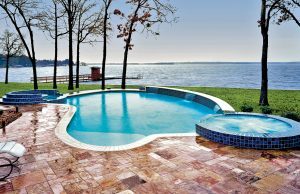 Financing a new pool & spa is a common approach among Fort Worth homeowners. For this reason, Blue Haven stands ready to help connect you with home improvement lenders. Over the years, our loan specialists have helped arrange thousands of swimming pool loans right here in North Texas. We boast an unrivaled network of pool-loan funding programs, so we are uniquely suited to assist you in obtaining financing (oac) for a new pool & spa and related backyard amenities. In addition, for certain portions of progress payments on your pool, we accept Visa and MasterCard. Looking for a reliable custom pool builder? 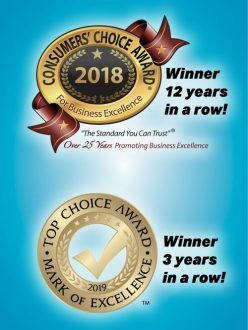 Blue Haven’s Fort Worth pool construction operation has three times won the Top Choice Award, which evaluates businesses in categories like online reputation, customer service, and value of products & services. It was also named a Consumers’ Choice Award winner 12 years in a row. Winners in this program are chosen by third-party surveys of local consumers about the business.